PORCINI AND SWEET PEPPER SAUCE. 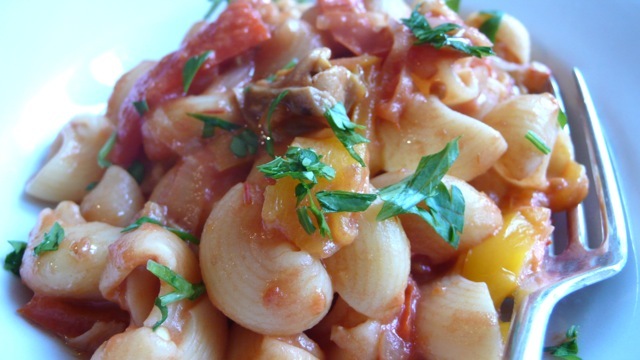 This is a variation of the basic tomato sauce using the last good summer peppers and the first porcini available in the fall. Vegetables are added to the onion and slowly stewed for a long time like a creamy compote. Use a shallow, thick bottomed pan with a lid over low heat. Soften onion and sweet peppers in 2 tablespoon EVO oil until soft and falling apart, about 30-45 min. When the mixture starts to dry out, add the soaked porcini with their water. Simmer until the soaking water is completely reduced. Add the tomato and cook for additional 10 min. until slightly thickened. Add cream, but do not cook it. Use with short pasta with a sprinkle of chopped fresh parsley or basil, if desired. This sauce can be prepared ahead and frozen. Serves 4.
how nice to hear from you. There’s a lot of time to come to Umbria before the season starts again! Letizia, I am making this pasta sauce right now but having trouble getting it to fall apart and not brown. It’s quite brown. But I’m just going to go with it! It smells delightful anyway and we will enjoy it I know. I was hoping to meet you in person this fall but life has intervened and now it will be May 2014, but I am determined to eventually cook with you in reality and not just virtually! Thank you for your way with food. Hi Phyllis, I am sorry but I have only seen your comment now, I hope you enjoyed the pasta anyway. I believe that reason of the color of your sauce is that you must have used to high heat at a certain point during cooking. My peppers stay red (or yellow) until completely cooked. They become brown when I add the porcini with their sauce. Winter peppers can be a bit dry so if they dont fall apart but only become very soft is OK. Buon appetito! It was delicious! Had my heat down low the whole time until it seemed it was not moving quickly enough for me, at which point I turned it up a little. maybe for too long! Haha. But anyway, it’s all good and eaten now and well-enjoyed. Thank you for the ideas!! Peppers kept their color but had some browned edges, which tasted great anyway. Live and learn! well, you can call it “caramelized peppers and porcini pasta sauce”!